Though the chances are getting fewer and fewer nowadays, because of the recession, but in Japan, you can get pocket tissues for free. 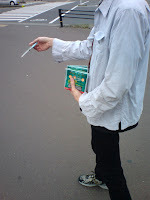 Seen in this picture, many companies like cellular carriers, banks, and sports clubs, are distributing pocket tissues for their advertisement on streets. Although they are free, but their quality is good. So if you come to Japan, you don't need to buy them. Except free pocket tissues, you may be able to get paper fans, candies, or little amount of bathing powders etc.